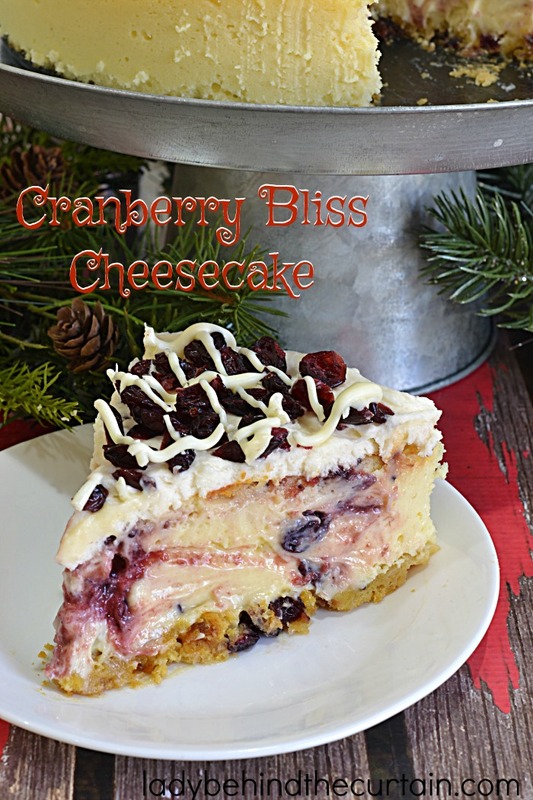 Cranberry Bliss Cheesecake | Dazzle your guests with a delicious Holiday Cheesecake and transform your favorite Holiday Starbucks Cranberry Bliss Bars into a dessert that everyone will be talking about! Unlike most cheesecake crusts this one starts with a brown sugar ginger sponge cake. 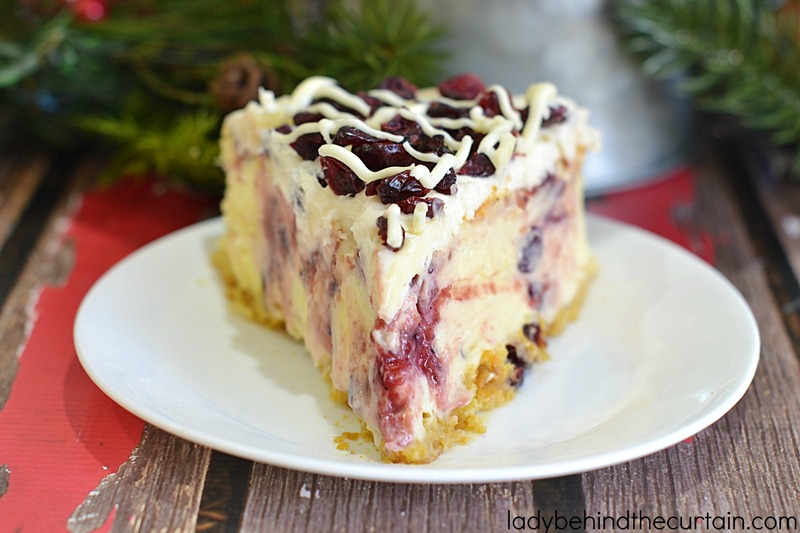 The filling is made with white chocolate and whole berry cranberry sauce. Okay, I’m sure I’ve got you hooked by now and I haven’t even shared with you the toppings! 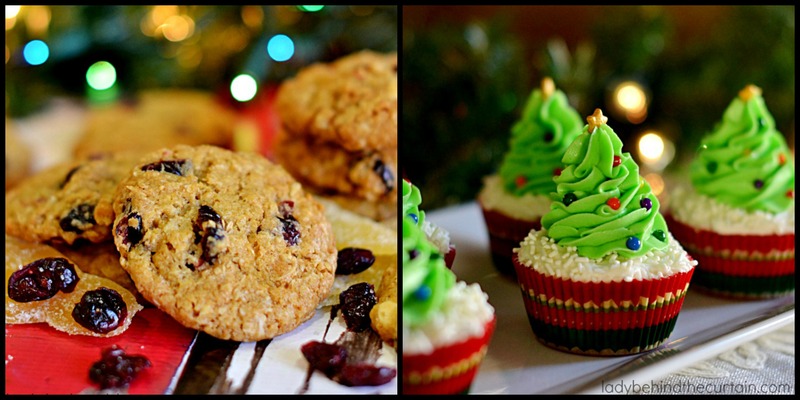 Butter frosting, cranberries and white chocolate or my! 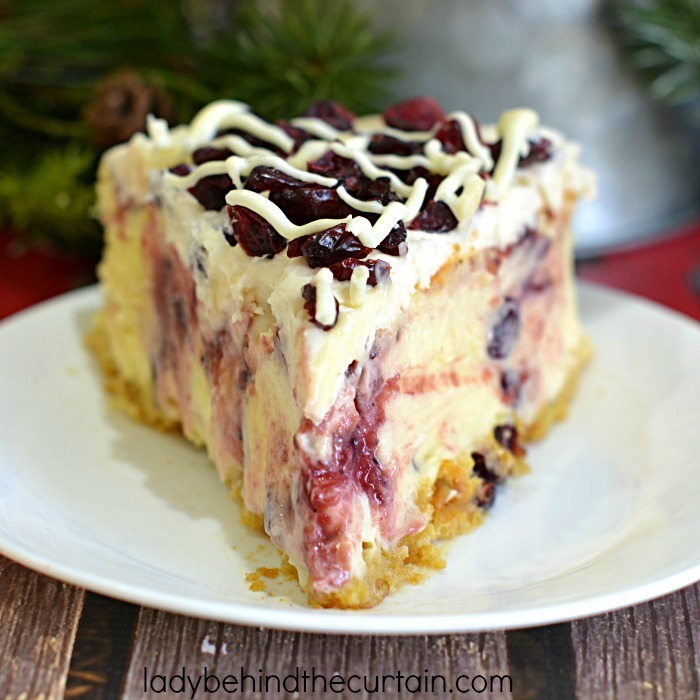 This cheesecake is a holiday on a plate and incredibly moist! HERE’S HOW I MADE THIS JAW DROPPING CREATION. Whip the egg yolks until thick and creamy; set aside. Whip the egg white until stiff peaks form. 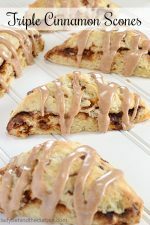 Fold dried cranberries and crystallized ginger into the crust batter. 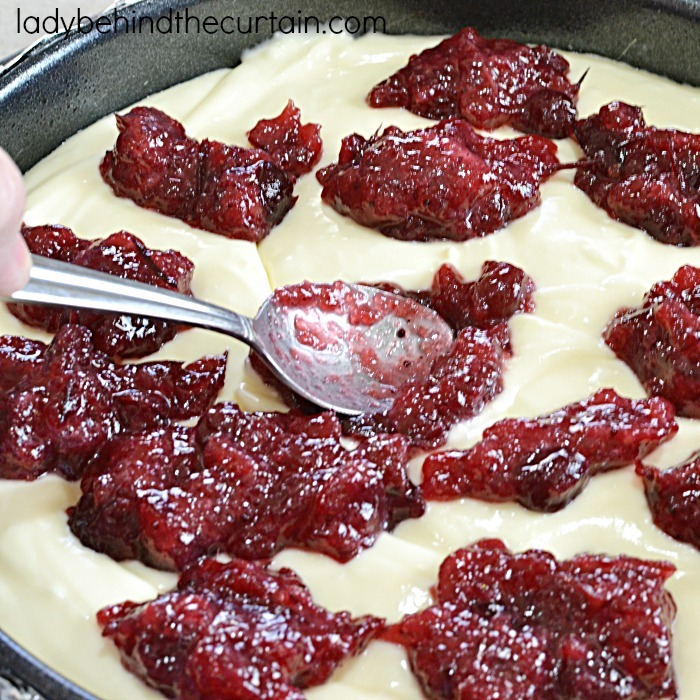 Add dollops of the cranberry sauce and push down into the cheesecake filling. Use a sharp knife to swirl the cheesecake. 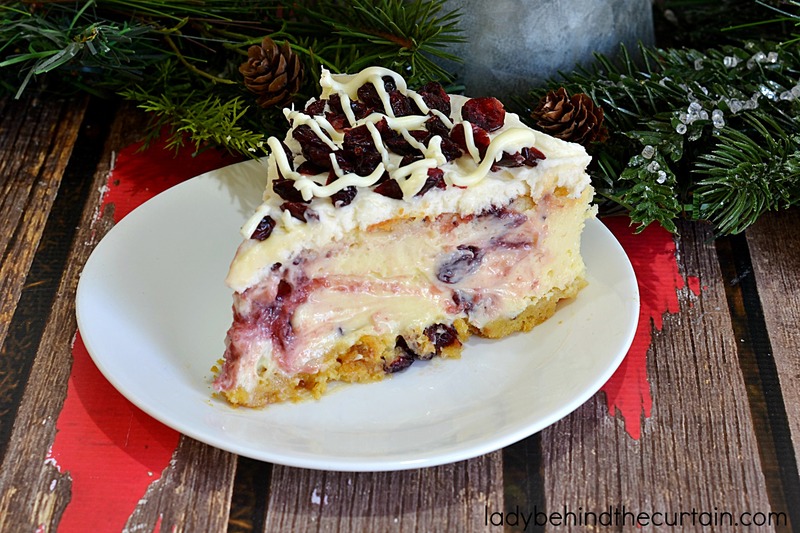 Add toppings: Butter Frosting, dried cranberries and a white chocolate drizzle. 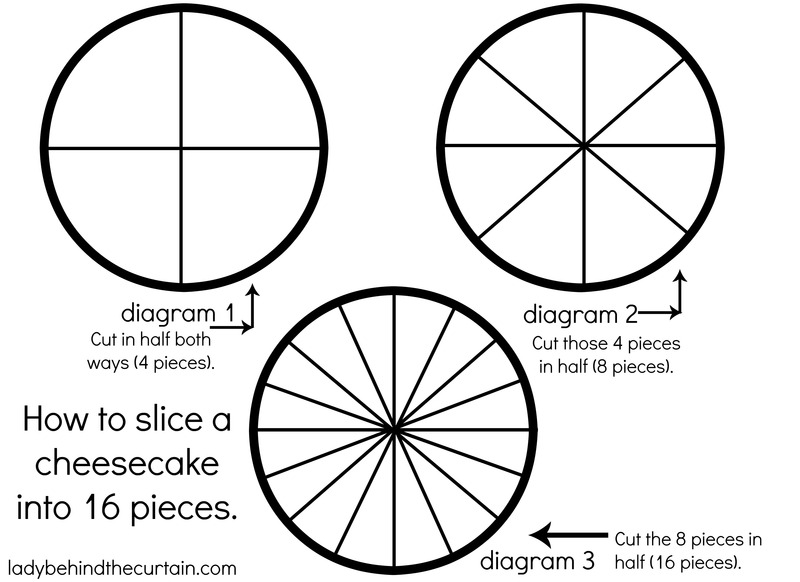 HERE IS A DIAGRAM SHOWING YOU HOW TO GET 16 SLICES OUT OF A CHEESECAKE. You can also print it for future reference. MAKE SURE YOU ARE IN LANDSCAPE MODE TO PRINT. Spray a 9-inch springform pan with non stick cooking spray. Wrap the outside with aluminum foil, covering the bottom and extending all the way up the sides. In a small bowl sift together the flour, baking powder and salt; set aside. Beat the egg yolks on high (about 3 minutes); slowly add 2 tablespoons brown sugar and the vanilla. Beat an additional 3 minutes or until the yolks become thick yellow ribbons. 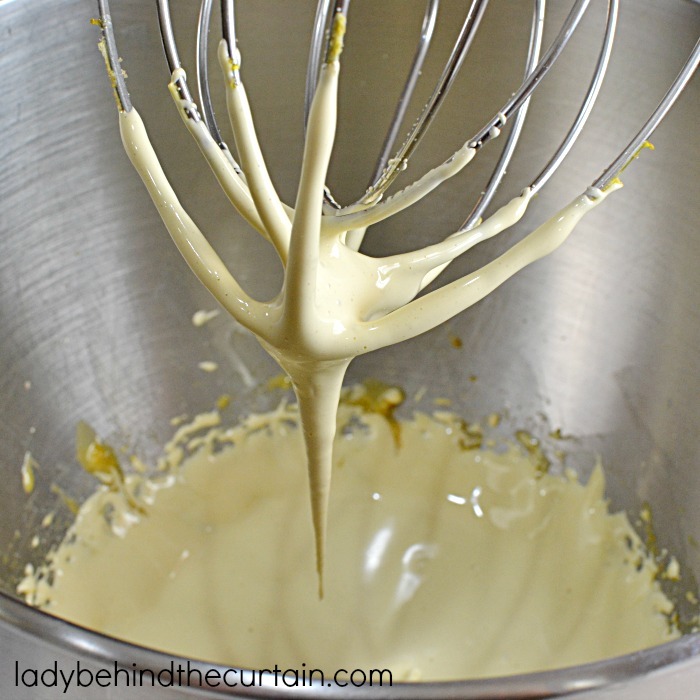 Add the flour mixture to the batter, blend just until combined; blend in the melted butter. TIP: Make sure all traces of fat is gone. Even a little fat can cause the egg whites not to whip. Add the egg whites and cream of tarter to the mixing bowl; beat on high until frothy. Gradually add the remaining brown sugar and continue beating until stiff peaks form (the peaks will stand up). Fold one third of the egg whites into the batter, then the remaining whites. 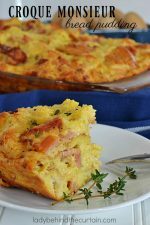 Gently spread out the batter over the bottom of the pan; place in a large shallow baking pan. Bake 10 minutes or until gently touched in the center the cake springs back. Leave the crust in the pan and place on a wire rack to cool; leave the oven on while you prepare the cheesecake batter. The oven should still be set to 350° from the crust. PLACE THE SPRINGFORM PAN BACK INTO SHALLOW BAKING PAN! Spoon the cranberry sauce into a small bowl, break it up with spoon, add 1 teaspoon of cornstarch, stir until smooth; set aside. 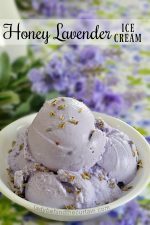 Pour white chocolate chips into a small microwave safe bowl; heat in 30 second increments, stirring between each time until chips are melted and creamy; set aside. 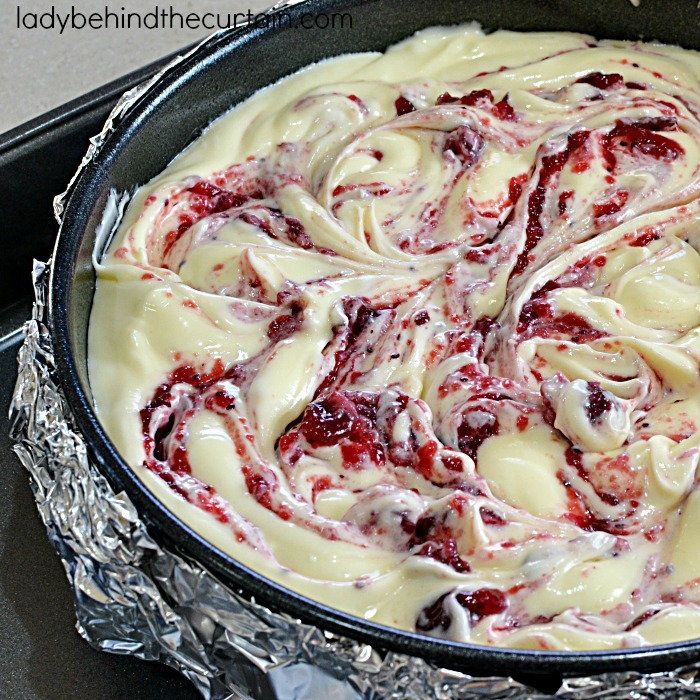 Place all the cream cheese into a large mixing bowl; cream until smooth. Add the sugar and vanilla; blend until combined, light and fluffy. 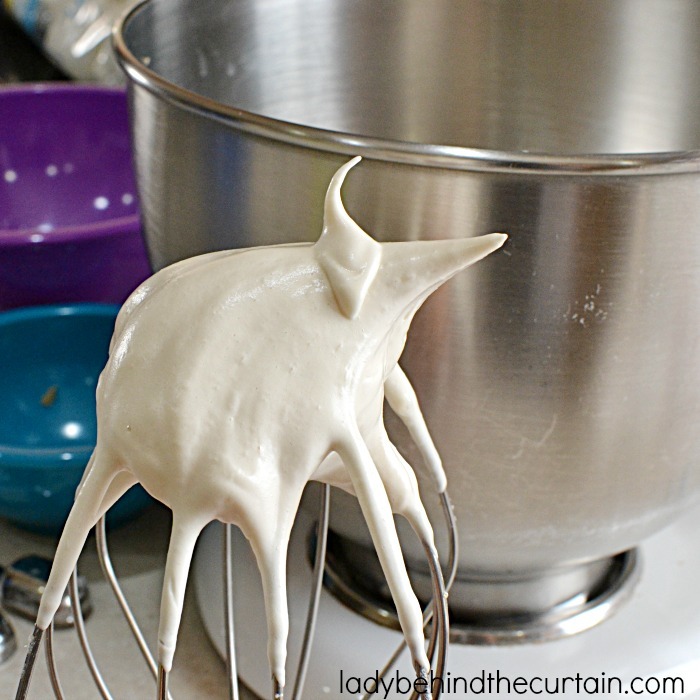 Blend in melted white chocolate. Blend in the cream just until combined. 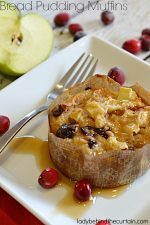 Drop cranberry sauce in spoonfuls on top of the batter; slightly push down cranberry sauce into the batter with the spoon. 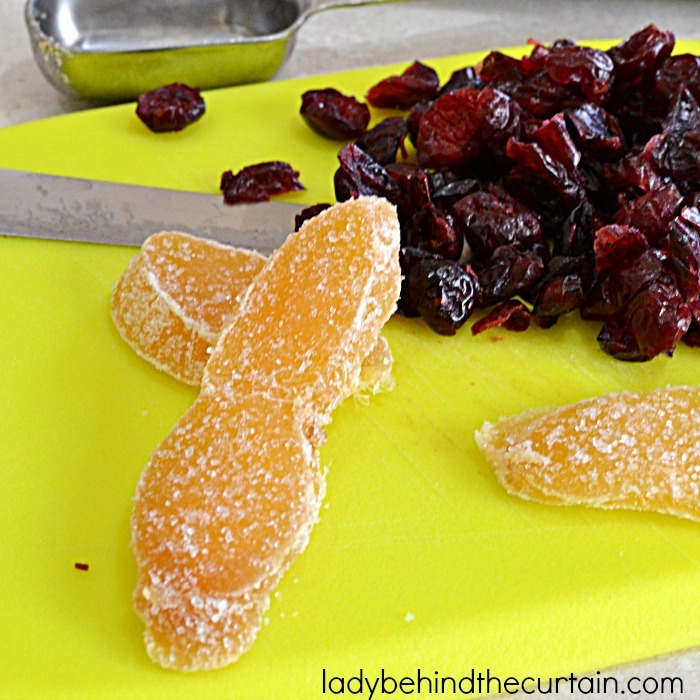 Use a thin sharp knife to form red swirls. Place the cheesecake in the shallow baking pan in the oven. 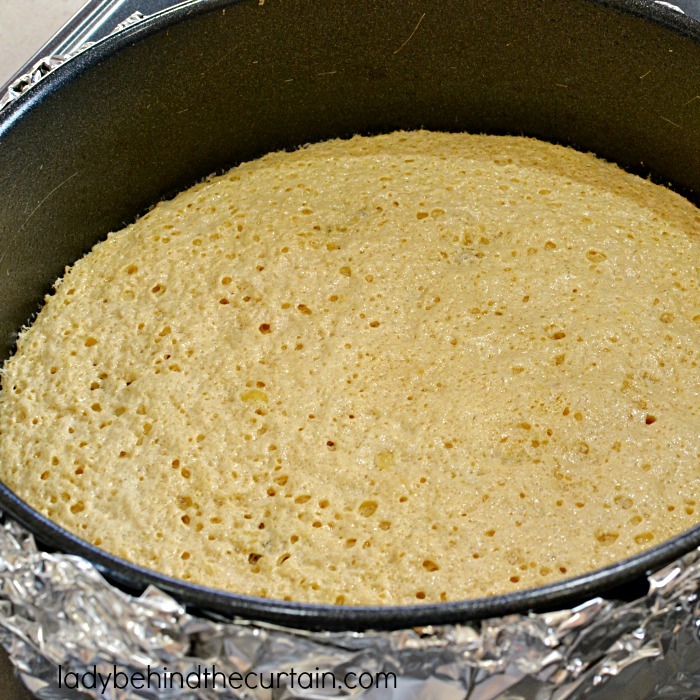 Fill the pan with hot water that comes about 1-inch up the side of the spingform pan. 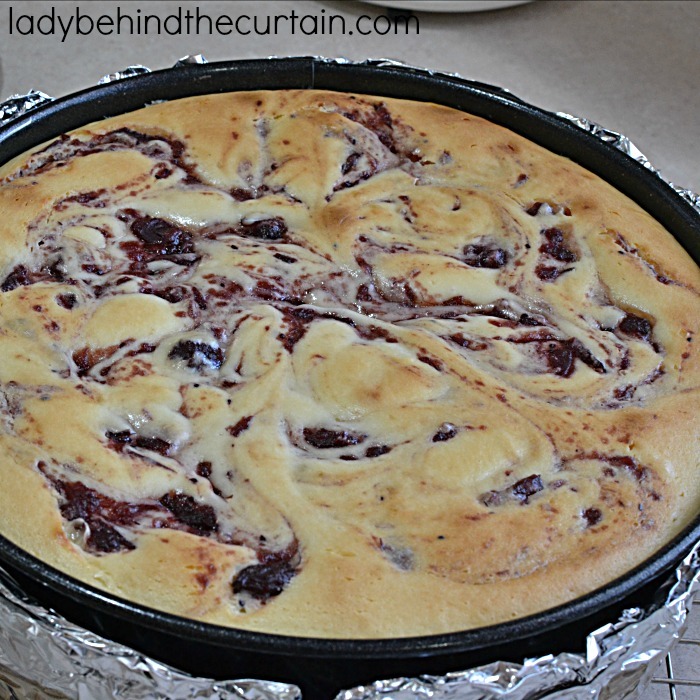 Bake until edges are light golden brown and the top is slightly golden tan with cranberry swirls (about 1 hour and 15 minutes. 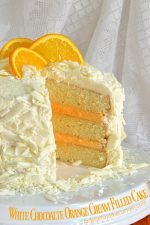 Remove the cake from the water bath, transfer to a wire rack, and let cool for 2 hours. Refrigerate until completely cold (preferably overnight). Add the butter to a mixing bowl; beat until light and creamy. Add the confectioners sugar, vanilla and milk. Release the side of the springform pan. Gently spoon frosting on top of the cheesecake; spread to the edges. Pour white chocolate chips into a small microwave safe bowl; heat in 30 second increments, stirring between each time until chips are melted and creamy. 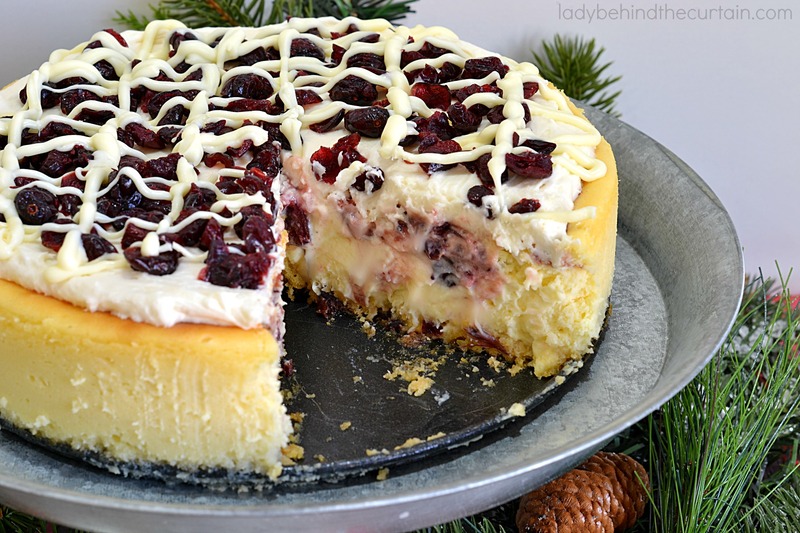 Use a fork and drizzle on top of the cheesecake in a back and forth motion. 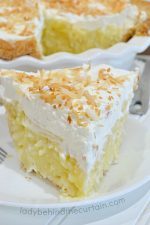 TIP: To make nice slices of this cheesecake it's easier to dip a large knife in hot water; wipe off water and then slice. Also take the cheesecake out of the refrigerator 20 minutes before serving. That will help with the slicing too. 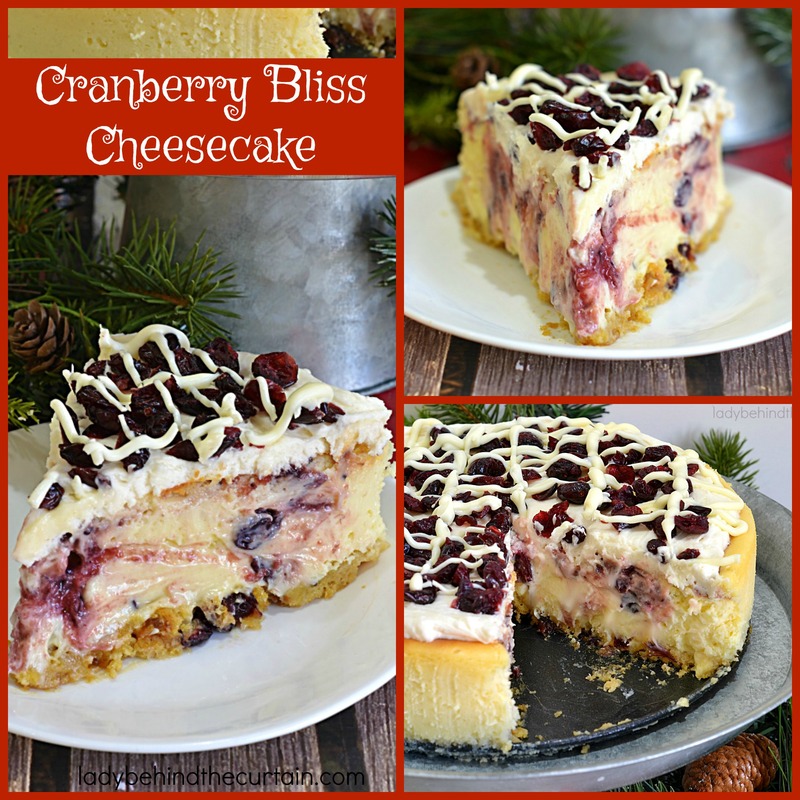 I just love all of the cheesecakes you post 🙂 By the way I just thought I’d mention that you have one of my favorite blogs and I’ve added you to my sidebar at my site. Hope you are having a good December!